In Monday’s post I mentioned two exciting novelists whose work I had just discovered and was devouring in huge, quietly ecstatic chunks. Here’s more on them both. I’ll try and write more about the stuff I’m reading in future. Since, you know, this is a blog about books. Emily St. John Mandel is published by Unbridled Books, a small publisher based here in Columbia, MO, which punches (pardon the pugilistic cliché) well above its weight in the literary world. I had lunch with her editor a little while ago (clang!!) 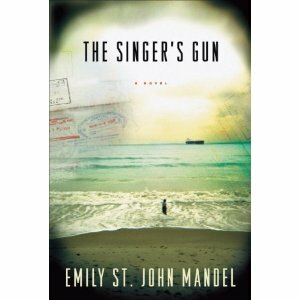 and he was kind enough to give me a copy of her latest novel, The Singer’s Gun, which I thought was unusual and brilliant. It’s a book that defies easy description or categorization, but what I can tell you is that it’s very, very good. While we were in Boston I found her earlier book, Last Night in Montreal, and devoured it in a couple of days. It is still haunting me now. The book is filled with an exquisitely mournful sense of lost connections and fleeting, unfulfilled desires. I loved it and was very sorry when it came to its beautifully wrought, unsettling end. Mandel is of those writers who seems incapable of writing a dull sentence. I can’t wait to see what she does next. I feel kind of stupid for only now discovering Jennifer Egan. There’s been much laudatory noise in the blogosphere about her newest book, A Visit From the Goon Squad [cue instant title envy] but I started with her second novel, The Keep. This was one of those rare books that managed to do something completely new. I was constantly being turned about, left in a state of delicious bewilderment as I was never quite sure what was going on. In the wrong hands this sort of metafiction, reader-teasing stuff can grate hugely, but Egan pulls it off brilliantly. The best comparison I can make is The Magus, by John Fowles (and this is high praise indeed from me.) Highly recommended. I was so impressed that I went straight out and bought her earlier novel, Look at Me, and am presently being hypnotized by its enigmatic, multilinear story line. To my pleasure and astonishment, it’s even more impressive than The Keep – which for all its cleverness seems a little one-dimensional in comparison to this one. Egan juggles parallel, complex story lines with total ease. She swaps perspectives and characters with an assured deftness that is beginning to get me down, just a little, it’s so good. I’ve not finished it yet, so I suppose I should withhold a degree of judgment until the end, but my goodness, I am enjoying it an awful lot. And damn, she writes beautifully. Here’s a sentence pulled at random from this evening’s reading, describing New York traffic: “A clot of yellow cabs had formed, all oozing in a kind of agony toward a single destination.” There’s page after page of this stuff. It’s stupendously good. I saw Jennifer Egan read last night at the book store down the block. Near the end of her book tour for Goon Squad, she chose to talk and read in equal parts and it was very enlightening for the writers in the crowd. She discussed her process in great detail and read from two sections of the new novel, which also seems to defy categorization. I do look forward to reading her work. It’s such a pleasure to discover a writer who already has a body of work out there! Inspired by your description, I just put Last Night in Montreal on hold at the library. Every copy is currently checked out, so I hope I don’t have to wait too long to get it. I also have A Visit From the Goon Squad on my list. I too have seen the glowing reviews around the blogosphere. But what really caught my attention was the book’s cover (I’m somewhat ashamed to admit).